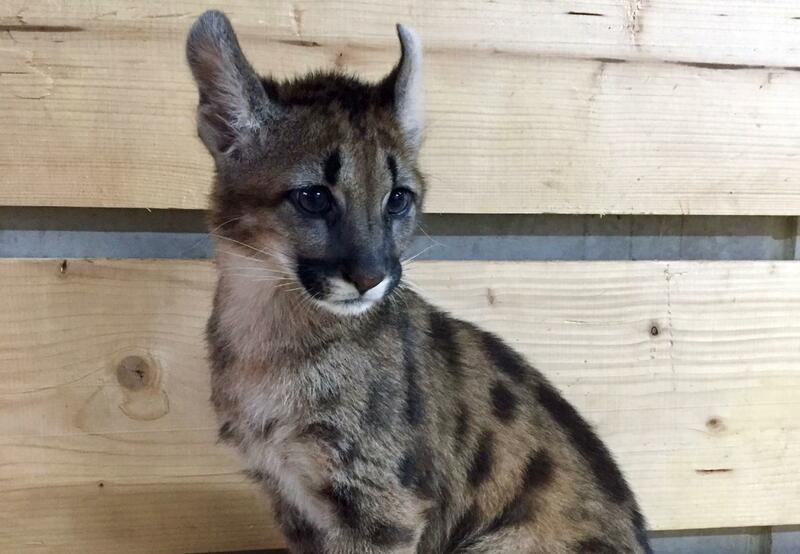 Shortly before Christmas 2018, authorities discovered and confiscated a male puma cub in a private apartment in the German city of Lahr. The then two-month-old exotic pet was legally bought in the Czech Republic but illegally smuggled into Germany. The international animal welfare organisation FOUR PAWS has taken the cub named Tikam into its care and will place him – after his quarantine stay – in its Animal and Species Protection Centre TIERART in Maßweiler. Tikam's sad case is yet another example of how Europe’s legal trade in tigers and other cat species overlaps with illegal activity which FOUR PAWS aims to stop through its campaign calling for a ban on commercial trade. The owner of the property where the puma was being kept drew the attention of the authorities to the unusual pet. The young puma was purchased from a Czech breeder for 2,300 Euros and brought to Germany by car. The buyer, however, had no permit to keep the puma, or export and import documents to take it from the Czech Republic and into Germany. Furthermore, it was revealed that the animal’s papers showing its vaccination record and origin were switched. “Keeping a puma in a small apartment is not only absolute animal cruelty, but also dangerous for the owners and neighbours. What looks small and cute now will later develop into a predator weighing up to 100 kilos. In addition, it was extremely concerning that Tikam didn’t have a record of rabies vaccination, so we had to quarantine him immediately and have him vaccinated to avoid a potential risk of infection,” says Florian Eiserlo, site manager of FOUR PAWS Animal and Species Protection Centre TIERART. There, the young puma will find a new, species-appropriate home after his quarantine period. It is not possible to release the puma into the wild, as Tikam was solely exposed to human contact and would not be able to survive in the wild. Tikam’s story is yet another bizarre example of how easy it is to purchase exotic wildlife in EU countries and smuggle them into other EU countries. This is due to insufficient controls and inadequate legislation in the EU. “More and more wild animals are being found in questionable environments in the heart of Europe. Our latest research shows that many big cats – especially tigers – are legally bred within the EU and sold to private individuals, dubious zoos or to Asia. Tigers are even slaughtered directly in Europe and their body parts are later processed for traditional medicine. Bones, teeth, skin and claws make a lot of money on the black market - trading big cats is a lucrative business,” says Kieran Harkin, Head of Wild Animal Campaigns at FOUR PAWS. Since the breeding and trading of tigers is legal in many EU countries, the region has developed into a hub for the trade of big cats, especially tigers and tiger products. “There isn’t a lot of up to date information on how many wild and big cats are kept in countries like Germany and nobody really knows how many big cats are kept in living rooms or backyards. The current legal situation is beyond deficient and leads to the fact that countless numbers of animals are kept in absolutely inappropriate circumstances. Moreover, the amateur handling and attitude towards wild animals are also a danger for other humans and animals,” says Harkin. FOUR PAWS therefore calls on the European Commission to introduce stricter regulations and to ban commercial trade of tigers and other cat species once and for all.